This is the first post of a new Tiny House Roommates series. 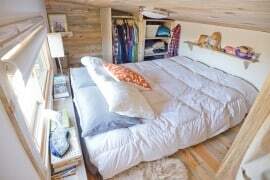 The second post will talk about living with your partner in a tiny house. Sharing a tiny house can be (as has been for us) a big challenge. Any of you tiny house dreamers thinking of living with your partner and or your pet(s), take the time to consider what life will be like when sharing such a small space. First off, our dog (Anya) is very happy. She is extremely well treated. We walk her religiously, twice a day, rain or shine, no matter what. We feed her grain free, natural food, with a special special raw meat treat for dinner. Having said that, I think like any animal (human included), she would probably be even happier with more space to run around. 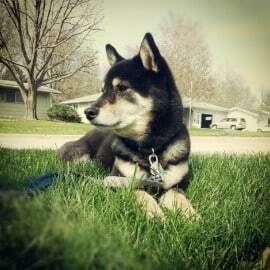 Our dog is a shiba inu, a breed that is never supposed to be let off leash unless in a fenced in area (an agreement to adhere to this was actually part of our adoption paperwork). More and more frequently these days we’ve been breaking the rule, letting her run around the back yard where our tiny house is parked. But when we used to live in a larger house, she had much more room to play indoors, something she does not have now. If planning to live in a tiny house with a dog, be aware that they will need more time outdoors — more time on walks and just playing — to help balance out the other times of day where they may be stuck in pretty tight quarters. It’s nothing like a kennel, but be aware that the small space of your tiny house is still restrictive to your pets. How does your dog get up to the loft? No doggy furry hair mess up here! To put it simply: she doesn’t. Since our tiny house plans do not include any separate “rooms,” we decided to make the loft our one sacred space, where we could maintain some control of the dog hair situation during her shedding periods, and a place that was always clean for us to climb into each night. Many people are used sleeping with their dogs in bed with them, but that is not a habit we had before, so this transition was pretty easy. In our previous living situations, Anya would come into bed and play with us nearly every morning and night, but when it was time to sleep we told her to go to her own bed, so we’d have the room we needed and no interruptions to a good night’s sleep. That practice remains unchanged for us. For those of you wanting easier access for your dog (or cat) to join in the loft, the options are to carry them up yourself (Dee Williams did this for years! ), or to install a small set of stairs instead of a ladder. Some people have asked me about this in relation to my tiny house plans for sale, and I tell them that the folding table in the living area can be removed to make more space for a creative set of stairs like this. 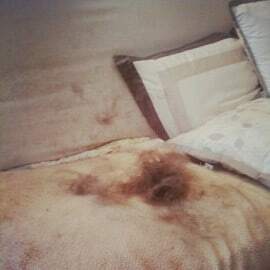 crazy amount of dog hair! Uh oh, it’s shedding time again! We like a clean home. When sharing a tiny house with a pet, this is a very hard thing to achieve. 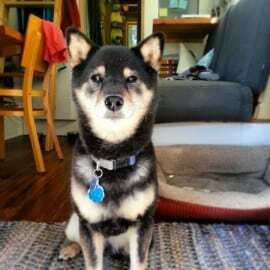 Our Shiba sheds her undercoat a few times a year, a process that lasts about a month in which an ungodly amount of hair and fuzzy thick undercoat come out almost constantly, and at time in clumps, creating the need for daily (maybe hourly) cleaning. All dog owners already know this, but keep that broom or vacuum handy (unless your dog tries to attack it, like ours does), because if and when your dog sheds, it becomes a daily chore to keep the floor even close to clean. This is the biggest one for us. Our dog is ALWAYS in the way. She has little to no spacial awareness when it comes to understanding OUR need for space — she loves to hang out in the tiny kitchen when we cook, or in the middle of the narrow hall exactly when we are trying to walk through. Now it’s cute that she just always wants to be near us (and admittedly has few options as space is limited), but in this way sharing a tiny house with a dog is more challenging than with another human. You simply can’t tell them to move over quickly. The often don’t understand. Even if your hair is on fire or water is spraying everywhere, or maybe especially in those instances, you’ll find your dog exactly in the wrong place, blocking your path. If you live in a big house and often find yourself tripping over your dog, accidentally kicking them when they catch you unaware of their position, then maybe a tiny house is not for you. It will just be 10 times worse. So, is it all bad? Of course not! We love living with our four-legged best friend! It just wouldn’t feel like home without her. As any dog owner knows, there’s nothing like being greeted by doggie kisses when you get back home after a long, hard day. I only write this post to emphasize that living with a dog in a tiny house is not a decision to be made lightly. Take the time to think about their daily routine (and yours!) to make sure neither of you will be compromising too much in order to make your tiny house dreams come true. At the end of the day, I’m sure most people will do just about anything for their amazing pets, but remember your needs too! In order to maintain yours and your dog’s sanity, maybe you need to invest in an outdoor play area or pay a dog walker on some days to make sure he or she has lots of time outdoors. Do whatever you need to do to make sure your tiny house is serving the needs of both your and your pet! Do you live with pets in a tiny house? Tell us your story! I live in a 600 sq ft trailer (monstrous by tiny standards) with two big, young, energetic dogs (Siberian Husky and Australian Shepherd). This works because I have a big fenced yard (small house – big yard), a dedication to long walks, regular dog brushing and a powerful vacuum cleaner. There are no stairs or restrictions for the dogs inside because I like them with me at night. Their hair will go everywhere in the house whether they are let in a room or not so I don’t worry about it. I think we could easily go tiny with one of the models that includes a downstairs bedroom but only because of the large outdoor spaces the dogs have to roam in as they are movers and shakers in need of independent romping. I avoid stairs because as the dogs age the steep stairs would be a problem. My previous pup couldn’t manage stairs at all in his final stages and would have been upset if he couldn’t get to me during the night. That’s why I was so pleased to see the models that were all on on floor. I moved from a large fenced home to a 450 sq foot unfenced apartment and am still waiting to get into my tiny house. In the house I had a pet door and plenty of room for the animals to move around in but I realized my 4 mutts (from 20 to 100lbs) were under my feet at all times. I could have lived in a closet and they would have been just fine. Two walks a day and a tie down that screwed into the ground gave them plenty of outdoor time when they wanted to just lie around in the sun or experience the grass under their feet, or run from here to there – invaluable tool. I just learned to look down before taking a move and nobody got stepped on or I didn’t trip over backwards on the big one. The loft would be my downfall. I had 3 out of the 4 dogs that would have killed to sleep with me at night. I have to have a downstairs bedroom and you’re right after they get older it’s too heart breaking to see them trying to make it up stairs to be with you. Thanks for the post. It’s important to know your dogs temperament and act accordingly to make them happy. Though out the years we’ve been downsizing our living space and now we are looking to completely free our selves from all that ties us down to one specific location and are looking into selling our home and getting into a tiny house. I am pretty handy so I am looking at building our own little house! We are currently looking for a floor plan that’s roomy enough for two and up to three dogs with double loft for bedding so we can have guests stay over night. How I understand the dilemma! We (my 21 yr old daughter and I , and our 3 small dogs and one huge cat) recently sold everything, rented a small storage until we can sort through what’s left. We started about Aug 15…moved in about Sept 22nd…and finished the move out of our 1500 Sq ft, 3 berm 2 bath house with the double car garage and big fenced back yard by Sept 30th. We are still adjusting some…finding places for necessary crates, feeding time is a fiasco…but do-able. Potty time is currently being solved by putting up a small, albeit expensive, garden fence just tall enough to keep them in. I put green mesh fencing along the trailer to keep them from going under it and escaping…and am purchasing some bags of gravel to put in one corner of our “yard” for poopies. Time will tell if we need to tweek things, but just being able to open the door and let them run is valuable for me…I like to grab me coffee first thing, so they have their moment to bust out and run a little in the morning. It’s all good. Thank goodness for cultivated friendships that have allowed us a beautiful view of a Texas meadow, birds, toads, bats…and close neighbors like family that share their space with us. Ahhhhhh……?